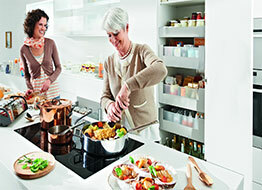 You will send us your plans, requirements, list of appliances you wish to use by e-mail. We will design functional designer kitchen for you with in 48 hours from the time of receiving payment and information from you. You will get PDF files of CAD drawings, 3D design with colour rendering as well as a link to your purchase account with complete costing via e-mail. This service is fully refundable for the clients how made purchase with us on line*.